CDI College's Accounting and Payroll Administrator program in Manitoba gives you the hands-on accounting training that employers demand. You will master computerized accounting programs such as Sage 50 and other industry-standard software. You will also learn the manual accounting fundamentals you need to fully understand the bookkeeping process. Well-trained accounting and payroll professionals are in-demand across the country. Every small, medium, and large company relies on their accounting department to keep things running smoothly. With hands-on training in practicum placements, students will graduate with the practical skills and real-world experience employers are looking for. This program includes a practicum component consisting of 100 hours of work. This practicum work experience is a mandatory diploma requirement and the business organization does not pay for the services of the student during the practicum. This is one of three compulsory courses for the CPA’s Certified Payroll Management Program. Students who complete this course will be able to apply payroll legislation and calculate individual pay. This includes all components of individual pay from remuneration through deductions to net pay for both regular and non-regular situations. In addition, students will be able to accurately complete Records of Employment. This is one of three compulsory courses for the CPA’s Certified Payroll Management Program. The course provides students with the payroll-related legislation affecting organizations as well as the tools to find information and apply that information to different scenarios in relation to individual pay. Students focus on the following topics: special journal and subsidiary ledger systems, cash control and banking, completing accounting cycle for merchandising company and preparing year-end financial statements. By the end of this course, students will have an in-depth knowledge of the complete accounting cycle including the flow of funds in an organization. This course is designed to impart the knowledge and skills that are essential to work successfully in today's office environment. The course deals with the challenges when working as an administrative assistant covering a wide range of topics ranging from duties, the changing workplace, office politics, ethics, and attitude to organizing time and organizational structure. 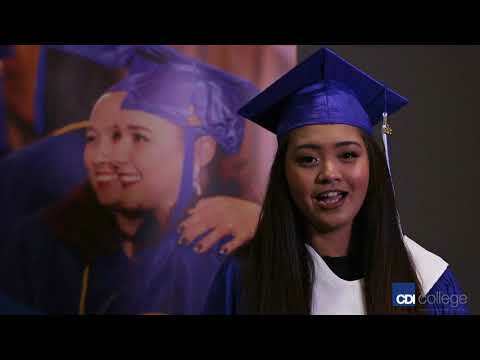 Janea's mom and brother got their job-ready training at CDI College and are enjoying their careers, so it's only fitting she attended the Accounting & Payroll Administrator program to get the training needed for her own career.